Quick Review: A great way to begin a reboot. And this brings us to Justice League #1, the issue that relaunches the brand new (again) DC universe. The story told is simple. Batman and all the other heroes aren't trusted and, in Batman's case, considered just as bad as the criminals. 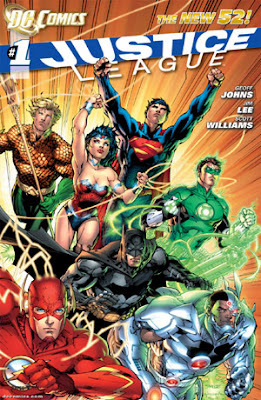 This first issue has Batman meeting Green Lantern for the first time as they fight an alien menace. This takes them to Metropolis, where they track down the only alien they know about: Superman. So far, I'm a fan. I like the fact that the heroes aren't automatically trusted. I like how Green Lantern is shocked that Batman is just some guy in a costume, and my favorite moment is when Batman proves why he's more than a match for the super power set. I like that it seems these characters aren't going to instantly like each other (no Superfriends here) and instead will clash as they figure out how to get along and save the world. There's something refreshing about a clean slate. The stories aren't bogged down with previous continuity, and readers don't have to know 20+ years of story to appreciate what's going on. Granted, we're going to get massive continuity as this universe progresses, but for anyone wanting to jump into the comics, now is the perfect time. This isn't just hitting the rewind button; it's very similar to the new Star Trek, where we have the same characters and the same universe, but thanks to time travel everything old is new again. We're not going to have the same old Batman and Superman adventures, we're getting something all new. For starters, the costumes are different. The personalities aren't quite the same as they were. Superman is younger than we're used to, and it's going to be interesting to see how this all plays out. Now, one complaint about superhero movies is that we have to sit through a tedious origin story as we wait for the good stuff. (Which is why the second installment is usually better than the first.) The reason we find those origin stories tedious is because we know them already. Not the case here. While we know that these heroes will become the Justice League, we don't know how because the story is different, the heroes are different. This origin is nothing we've seen before, and that's why it works. While we're back at the beginning, we're in a totally new direction. Ultimately, time will tell whether this first issue leads to something great, or if DC's grand experiment will crash and burn. So far, based on the one issue I've read, it seems to be plotted in the right direction. I can do more than review comics. Check out the book I wrote.